I know this post hasn't to do anything with Sitecore but also with Sitecore development we want to make sure our sourcecode is protected in some repository. In my past live I had to use Microsoft's source repository VSS to store my code and collaborate with my fellow colleagues. Even with VSTS this was still the way to go. And then it all changed when VSTS had the option to use it as a Git repository. All open source developers probably will laugh in my face right now but for me it was the first time I actually had fun with working in git. The old way I didn't find very flexible. The difference between Git and the old-fashioned way woring with VSTS is that VSTS relies that your changes are added onto the changes of others. Before checking in your code you need to keep the code in sync. If you don't you'll find yourself spending a lot of time resolving code conflicts. Setting up Git on your machine is extremely easy. Just download the installer and run it (next next next etc). So there's a lot of tooling available and thanks to the community and vendors you can choose between a lot of apps. This was the first app to work with. It has a nice interface and is built on top of a bunch of open source tooling. A great feature is having the option to push after a commit with a comment. What I don't like that much is that I have to swith to a different branch when I want to pull the latest changes. This is what I find very strong within GitKraken. Pulling a different branch while working in a different branch. The graph has a nice overview and also staging, stashing and popping is extremely easy. Initiating Git Flow is a little stashed away in the settings configuration of the app. Honestly I still use GitKraken for doing commits but with the integration with Visual Studio Code this has become obsolete. I just use it to see the flow. Make sure to add the number of your PBI or task ID e.g. #26543 this will associate that item to your commit. When creating the pull request and the VSTS-template forces you to add the PBI association, you don't need to add it because it is there when you added the id in the commit. So make sure when squashing that your id does not get omitted. Existing commits on the source branch are unchanged and remain valid. When multiple people work on the same branch, the merges don’t serve any useful historic purpose and create clutter. Enable force push on VSTS. This may damage your Git repo and you should understand what you are doing! Rewriting of history has a high impact on fellow developers. git status - check if you have no issues or even when you forgot to commit. git rebase -i HEAD~2- rebase interactively so you can squash the commits. This allows you to merge your commits. 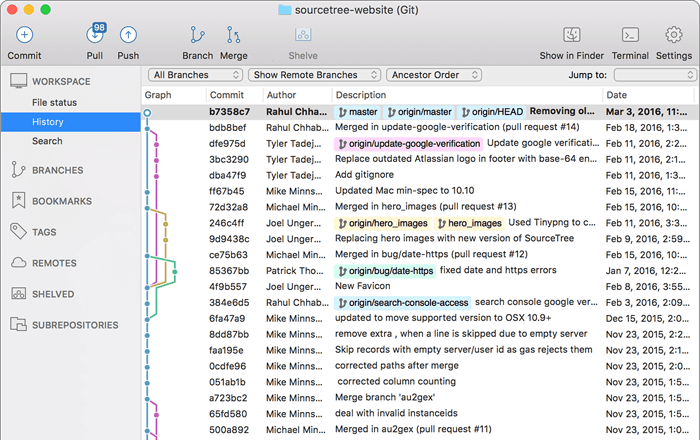 git rebase develop - does the actual rebase onto the develop branch. git push -f - force push your changes. Now you're done to create your pull request.